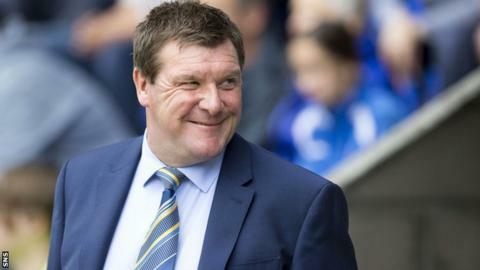 St Johnstone are refreshed and ready to challenge the second and third placed sides in the Scottish Premiership, says manager Tommy Wright. Wright hopes his side can extend their three-match winning run in the league. "What recent results and performances have done is put us in a really good position to challenge Hearts and Aberdeen," he told BBC Scotland. "In the run we are in at the minute, anything is achievable, but that run has to continue." Wright, whose side sit fourth, believes the break allows the players to recover from their early season exertions. "I've always thought the international breaks, if used wisely, can play a big part in your season," he said. "There is no break now until March, so you have to make good use of it and never look too much into results straight after it. We look at it over the season." The Perth side also have a Scottish League Cup semi-final to look forward to against Hibernian at the end of January. The game will take place at Tynecastle, the home of Hibs' Edinburgh rivals, Hearts, instead of the national stadium at Hampden Park in Glasgow. "I know Hibs maybe think they would have taken over 20,000, but there is no guarantee of that," added Wright. "So I feel a stadium that holds around 18,000 will set up for a cracking atmosphere. "I'm delighted with the venue. I think it will be great. I think it is common sense."